A little bit of The Nun goes a long way. With her cheekbones jutting like daggers from her chalky-white skin, her eyes a piercing yellow beneath her habit and her ravenous, bloody fangs, The Nun served as a deeply unsettling image in brief but potent glimpses throughout various films in “The Conjuring” universe. Now, we get an entire film devoted to her: the appropriately titled “The Nun,” which simultaneously serves as an origin story for the entire franchise. And a presence that initially was disturbing grows repetitive and almost predictable over the course of an entire film. It’s sort of like the Minions. (Hear me out on this.) The Minions were the best part of the “Despicable Me” movies. They provided quick blasts of adorable insanity with their denim overalls and dazed expressions, their gibberish and their general incompetence. But a whole movie about them—again, the appropriately titled “Minions”—grew tedious pretty quickly when it came out on 2015. I’m not saying that The Nun is literally like an evil version of a Minion, although she does run around in a uniform, wreaking havoc and doing her master’s bidding. But there is a similarity to the shallow nature of these crucial supporting characters that reveals itself when a feature film focuses on them. But director Corin Hardy’s movie, based on a screenplay by “It” and “Annabelle” writer Gary Dauberman, has no shortage of mood. Set at a remote abbey in 1952 Romania, “The Nun” grabs you with Gothic dread from the get-go with its candlelit stone passageways, creaky sound design and the mesmerizing tones of deep, droning chants. Fog shrouds the overgrown grounds, which are dotted with makeshift wooden crosses. The feeling of foreboding is inescapable throughout. This place is cursed, and no amount of prayer from well-intentioned, young nuns can redeem it. 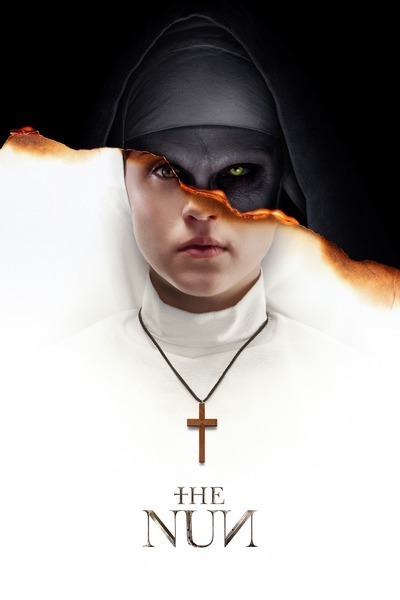 But after one of these devout, promising ladies hangs herself from her bedroom window at the film’s dramatic start, the Vatican sends demon hunter Father Burke (Demian Bichir) and Sister Irene (Taissa Farmiga), a novitiate on the verge of taking her final vows, to determine what forces are plaguing this holy site. Young Irene has been plucked for this dangerous assignment because she has a history of experiencing visions; in a clever touch that unifies the series, she’s played by Farmiga, younger sister of Vera Farmiga, who starred as supernatural seer Lorraine Warren in the original “Conjuring” movies. The younger Farmiga has a similar steely presence and a quietly authoritative way about her. Burke and Irene are joined by local farmhand Maurice (Jonas Bloquet), a flirty French-Canadian who goes by the nickname Frenchie. He serves as their guide, provides necessary comic relief and warns them that they’re about to enter the Dark Ages. But he has no idea just how dark the situation will get. The Vatican’s emissaries have the Sisyphean task of trying to interview the remaining nuns to determine how such a sad and sinful fate could have befallen one of their own. But they get stuck in one section of the abbey when giant, metal gates shut for the night, or they find that the sisters are in the midst of mandatory silence until sunrise. They’re spinning their wheels, and we feel like we are, too. Through it all, The Nun (Bonnie Aarons) wanders the dark hallways, an elusive yet menacing force. Seeing a glimpse of her habit is good for a jolt here and there, at first. But Hardy goes to that tactic repeatedly, showing us The Nun—or maybe just A Nun—kneeling in prayer from behind or from the side, or sneaking up on someone, hidden by reams of black material. This cheap thrill happens over and over, like clockwork. Hardy employs some visual acrobatics to liven things up in this cramped and clammy place; a couple of overhead shots are inspired, especially one in which Irene, in her white habit, is surrounded by her fellow nuns dressed in black and kneeling in desperate prayer. But by the end, “The Nun” has become an almost entirely different kind of movie, a puzzly “Da Vinci Code”-light, which sounds redundant, I realize. We eventually get full-frontal Nun—more Nun than you can shake a cross at—but even while she’s all up in our faces, it’s unclear what exactly she wants beyond run-of-the-mill possession. The “Conjuring” movies—especially James Wan’s original two, and not so much the “Annabelle” prequels—stood apart from so much demon-themed horror with their well-drawn characters, strong performances and powerful emotional underpinning. “The Nun” feels like an empty thrill ride by comparison. Once it stops and you step off, you may still feel a little dizzy, but you’ll have forgotten exactly why.